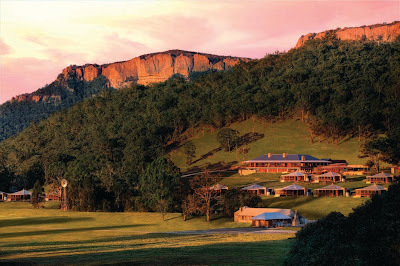 Australia's first conservation-based luxury resort, Wolgan Valley Resort & Spa, has received the Outstanding Contribution to Tourism Award as well as Best Environment Initiative and Regional Deluxe Accommodation of the Year in the annual Australian Hotels Association (NSW) Accommodation Awards for Excellence. Wolgan Valley was presented the awards at a gala presentation dinner, attended by dignitaries and 600 of the industry's business leaders and members. Now in its thirteenth year, these prestigious Awards recognise the leaders in hospitality and honour the achievements of excellence in a wide range of categories in the accommodation industry. Tony Williams Senior Vice President, Emirates Hotels & Resorts said: "With Wolgan Valley it was always Emirates' intention to showcase the enormous tourism potential in Australia; and careful, deliberate efforts were made to ensure the resort highlighted the luxury experiences available in Australia, and grow this sector of the market. We are certainly very pleased to have our commitments recognised in this manner." Joost Heymeijer, General Manager, Wolgan Valley Resort & Spa added: "It is a great honour to receive these awards. Wolgan Valley has only been open six months, and to win such prestigious awards, and be recognised by our industry colleagues and peers is an enormous achievement for the resort and Emirates. "Wolgan Valley adds value to the Australian luxury travel experience, and we see the resort becoming a highlight of many Australian itineraries, as well as a favourite corporate venue for business leaders." Wolgan Valley's awards in the competitive categories of Best Environment Initiative and Regional Deluxe Accommodation of the Year cements the Emirates Hotels & Resorts' property on the Australian tourism landscape. The resort was also awarded in a new award category launched in 2010 for Outstanding Contribution to Tourism which acknowledges the resort's unique place in the industry and its ability to set new standards and benchmarks in the Australian industry. Nominated, with Emirates Hotels & Resorts, in the World Travel & Tourism Council's "Tourism for Tomorrow" Awards. Wolgan Valley Resort & Spa will go onto the AHA National Awards which will be presented in September this year. Combining the expectations of the high-end traveller with a commitment to broader social, ecological and environmental sustainability, Wolgan Valley Resort & Spa is redefining what traditional luxury means to travellers. Wolgan Valley provides its guests unique experiences and insights into this fascinating continent, with in-depth experiences of its wildlife, history and cultural heritage. The resort is fully inclusive, and includes all its meals and on-site activities in its rates; with a major focus of the guest experience being the quality of Australia's finest produce and select ranges of regional fine wines and all non-alcoholic beverages. Located between two of Australia's most prominent national parks, and bordering the Blue Mountains World Heritage Area, Wolgan Valley was selected by Emirates after an extensive research for a location that lent itself to world-class conservation-based practices. The secluded resort also incorporates the 'Timeless Spa' branded facility offering guests world-class spa treatments in a luxurious setting of commanding views of the spectacular the valley below. The resort has recently become the first hotel in the world to achieve carbon neutral certification from an internationally accredited greenhouse gas certification scheme. Wolgan Valley is also a proud member of Leading Hotels of the World, the world's largest luxury hospitality organisation, representing more than 450 of the finest hotels, resorts and spas.